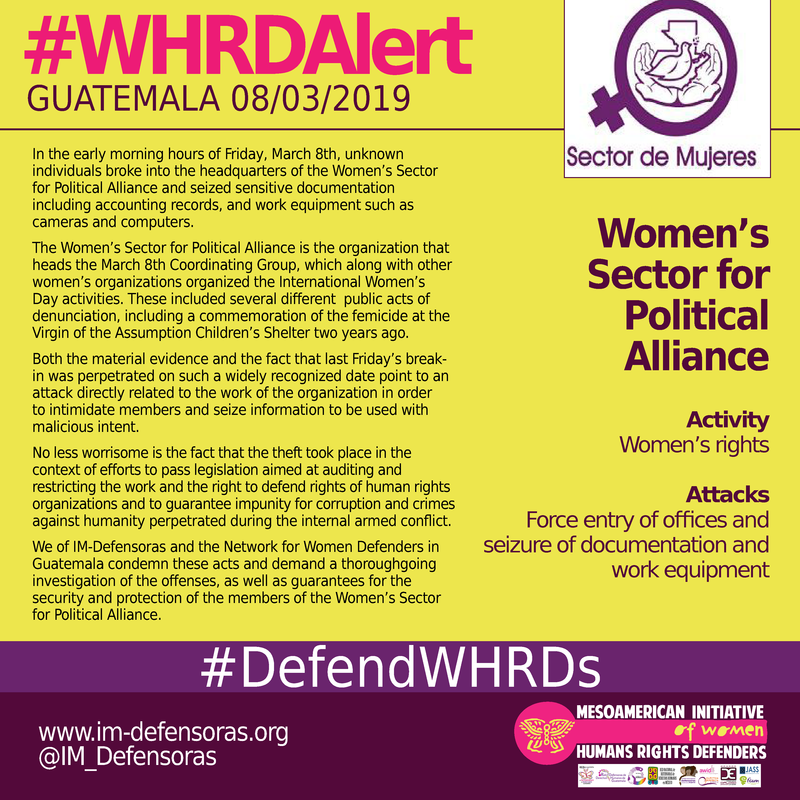 THE FACTS – In the early morning hours of Friday, March 8th, unknown individuals broke into the headquarters of the Women’s Sector for Political Alliance and seized sensitive documentation including accounting records, and work equipment such as cameras and computers. The Women’s Sector for Political Alliance is the organization that heads the March 8th Coordinating Group, which along with other women’s organizations organized the International Women’s Day activities. These included several different public acts of denunciation, including a commemoration of the femicide at the Virgin of the Assumption Children’s Shelter two years ago. Both the material evidence and the fact that last Friday’s break-in was perpetrated on such a widely recognized date point to an attack directly related to the work of the organization in order to intimidate members and seize information to be used with malicious intent. No less worrisome is the fact that the theft took place in the context of efforts to pass legislation aimed at auditing and restricting the work and the right to defend rights of human rights organizations and to guarantee impunity for corruption and crimes against humanity perpetrated during the internal armed conflict. We of IM-Defensoras and the Network for Women Defenders in Guatemala condemn these acts and demand a thoroughgoing investigation of the offenses, as well as guarantees for the security and protection of the members of the Women’s Sector for Political Alliance.